Saying goodbye to van life. Remember that scene on Mary Poppins after they visit Uncle Albert, and Mary Poppins announces it’s time to go? Then poor Uncle Albert, who has been laughing hysterically and having the time of his life, literally sinks down to the floor in despair, completely deflated thanks to reality’s blow? I hate finales. I hate last chapters. I hate curtain calls. And I hate the ride home at the end of a trip. I hate the last day at work even when I’m quitting, and I hate breakups even when I am the one doing it. Basically I hate endings. I’d guess most of us do. Saying goodbye to van life is no exception. Levi’s medical schooling has come to an end in California, and with only a couple months left before the start of residency, we plan to do a few last (not that word again) adventures backpacking Europe and some national forests before our final surrender to adulthood. So, we sold the van. My goal was to be able to report the van not only as a money saver, but as a profitable investment of our initial $2600. Like the show Flip or Flop. Levi thought I was crazy to ask for $4700. But I explained selling the van was just a matter of advertising. ’98 Dodge Conversion Van- Platinum Mercedes Edition. This is not a crusty old van, it’s a dream-mobile. It’s a vehicle for quitting the status quo and sticking it to the man. It answers the call of the wild, while calling it home. So take the driver’s seat on your life, and embrace the road ahead. Perfect bait for a disgruntled millennial looking for an instagram-perfect life, right? So it was more than a little surprising when a middle-aged man with a home and teenage son let us know he was interested. Before meeting up, Levi scrubbed her down and waxed her up until she (sort of) shined. We figured he’d like it for camping and road trips with his son, but nope. He let us know he didn’t like sharing a public bathroom while working the graveyard shift as a security guard, so he would be installing a toilet in the van. Our precious home was going to be a mobile PortaPotty. One man’s treasure is another man’s toilet. crying. I asked Levi to take one final pic of me hugging the van goodbye (silently thanking her for allowing me to hold on to my youth a little longer). Then this disappointing buyer asked me to please take a picture of him and Levi with the van…Uh…sure. SO I’m not sure if a regular Joe would have paid $4,000 for that van, but that’s what we got! Cha-Ching! That’s $1400 more than we paid. And about 1k more than what the average asking price for similar vans. Not to mention ours was a buy-back lemon. That’s a 54% ROI! Yeah baby! Nothing like a little cold hard cash to heal a wounded heart. Although we did put in $500 in parts, supplies and maintenance, ultimately the van did save us money, but probably not as much as you’d think. Buying every meal out nearly tripled our normal food budget, but we saved on rent, utilities and gas (no commute). Bottom line saying goodbye to van life sucked. The guy who bought it seemed as creepy as the van. And money softens both blows. Because saying goodbye to the van is as difficult as it was for its new owner to say goodbye to Levi, I have one more van post left of lessons learned while living in a van. Stay tuned. You are so nice Bill! I am so glad you’ve enjoyed it with us. And I may have to take you up on that last one. I’ll let you know. Your crying picture makes me sad…you know I’m the same way…endings are the worst. But that guy is so dang creepy!! I know you understand the sorrow of endings! Your writing on this entry was spectacular. If it makes you feel any better, every end is a new beginning. Craigslist ad for residency: It’s not just a crusty old job–it’s two crusty jobs back-to-back and squeezed into every week! It’s a vehicle to (delayed) adulthood and a way to ethically dodge paying any debt you might have accumulated during medical school! The hospital is just like a van home except there are way more bathrooms so you never need to get any fresh air. So bust through those sliding hospital doors with a fresh white coat and a fresh white smile to match, and take the first step on that four-year road ahead. P.S. Just kidding. It is not that bad. 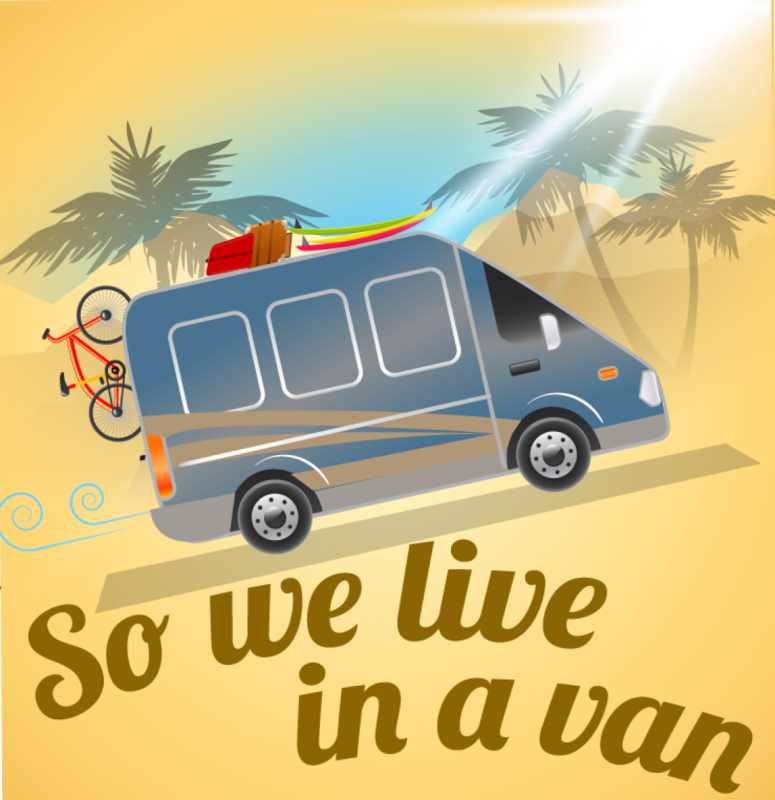 It might not even be as bad as many of your friends and family thought living in a van would be. Hahaha nothing can make residency sound better. I’m dying over here! You are so funny…I look forward to your next adventure in life and how you write about it. Thanks for being a faithful fan. I have so enjoyed you Van Life. I looked forward to each release. That probably says way too much about what I’m doing. I am excited about the new editions of “So we live in *********”. There has got to be some great stories…..
You give me hope for a future adventure! Thanks for coming along for the ride! I’m so sad it’s over! It’s been so freaking hilarious reading your story along the way! You two are crazy. I remember a few weeks ago Casey was like “how did they know each other would want to do weird things like this together?” haha so true. to the next adventure! And SOOO weird the guys going to install a toilet in it, seriously?